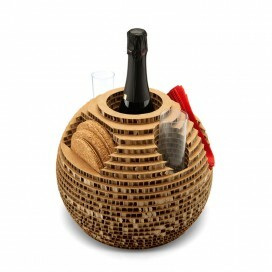 Recycled cardboard bottle holder with a pure and essential shape, which is carved with holes to accomodate a bottle of wine and table accessories. Designed by Giancarlo Zema. 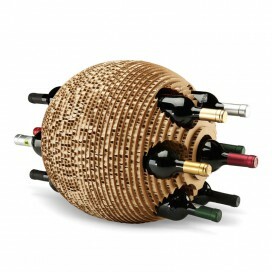 Recycled cardboard wine cellar with a pure and essential shape, which is carved with holes to accomodate up to 7/14 bottles of wine. Designed by Giancarlo Zema. 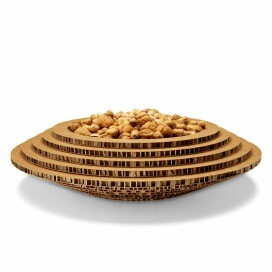 Recycled cardboard tray with a pure and essential shape; it can be used also as a centerpiece. Designed by Giancarlo Zema. 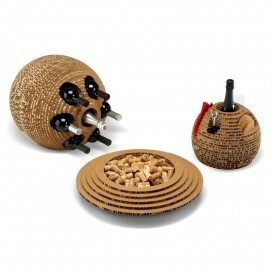 Recycled cardboard wine-set consisting of a bottle holder, a wine cellar and a tray, with pure and essential shapes which are carved with holes in an organic and playful way. Designed by Giancarlo Zema.